When the only food in the house—a jug of milk—gets spilled by accident, the children are sent into the forest by their angry mother to gather strawberries for supper—with almost fatal consequences. 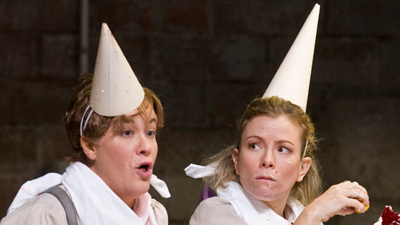 Humperdinck’s adaptation of the Brothers Grimm’s beloved fairy tale stars Angelika Kirchschlager and Miah Persson as the siblings of the title. Having lost their way in the woods, they encounter a strange old lady who lives in a house filled with sweets—played by the late Philip Langridge in his final operatic appearance. Fabio Luisi conducts.